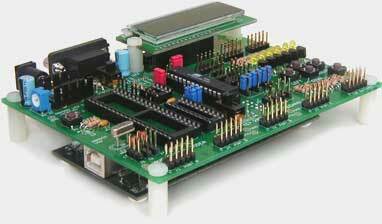 ECROS Technology offers comprehensive design and consulting services to the embedded systems industry. We can augment your existing engineering team or take a product all the way from concept to pilot production. Our competence includes digital and analog hardware, hosted and embedded software, printed circuit board design, systems analysis, requirements elicitation, documentation, manufacturing operations ... in fact everything you need to get your ideas into the marketplace. Please click the Services tab above to read more about how ECROS Technology can help with your product design and look at a selection of projects that we have completed. Below, you will find information about products that ECROS Technology offers to help embedded systems workers and enthusiasts. The Atmel AVR Dragon is a low-cost programmer for the entire line of AVR microcontrollers and provides on-chip debugging for those with 32 kbytes or less of program memory. However, it has no space for a target system and so falls short of the function of the venerable STK500. Enter the Dragon Rider! The ECROS Technology Dragon Rider fits over the AVR Dragon and provides target sockets for 40-, 28-, 20- and 8-pin microcontrollers, standard Atmel 10-pin port headers, add-on LEDs, switches, an LCD, serial interface and an external power supply. Programming connections are made with header shunts, not jumper wires, and the board is quickly reconfigurable for different target types. Small size / low weight JTAG ICE substitute for many of Atmel's ATmega MCUs with JTAG interfaces. Fully compatible with AVR Studio. Target powered, 3 V to 5.5V operation. Build your own projects on the Atmel STK500 using the expansion connectors and this inexpensive board. Eight square inches of prototyping space with true plated-though holes and an on-chip JTAG debug header. Printed Circuit Board and Parts Kits to make fixed and adjustable voltage power supplies for your projects. Use stand-alone, or mount on your project board. Just like the Mini-PSU, the Flexi-PSU printed circuit board allows you to build a power supply around the regulator of your choice. However, it is a little larger and uses a vertical, finned heatsink for considerably greater heat dissipation. This embedded systems project with real-world goals allows you to start small but build up to a simulation of a real traffic intersection with pedestrians, emergency vehicles, night mode and more. Display power-train operating information directly from on-board computers in this gasoline/electric hybrid car. No vehicle modifications are needed; the Mini-Scanner remains in the car as long as you want. These pages are maintained for existing owners. Done all you can with your AVR Butterfly? Give it a new lease of life by mounting it on the Butterfly Carrier and making it into a complete MCU development system! These pages are maintained for existing owners. Atmel and AVR are registered trademarks of Atmel Corporation. Material on this page is Copyright © 2006 to 2014 ECROS Technology, all rights reserved.